Foreign donors and security agencies are multiplying their efforts to reform the security sector in Lebanon. 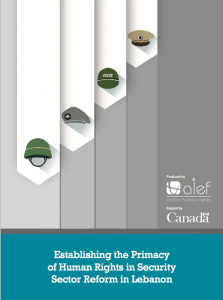 In such context, ALEF advocates for a security sector reform (SSR) approach that promotes human rights compliance in addition to state empowerment and the inclusion of civil society in the process. Based on interviews with security agencies, foreign donors, and civil society members, this paper maps some of the current SSR programs in Lebanon and assesses their impact on human rights. This paper also exposes the various challenges to the success of a human rights framework in SSR in Lebanon. ALEF hopes that this analysis will increase Lebanon’s civil society’s understanding of SSR and will promote further collaboration between local NGOs and SSR actors. It is only through such partnership that SSR actors will be able to improve the compliance of security agencies with human rights obligations. This paper assesses the impact of SSR programs on human rights and highlights the associated challenges with a particular focus on the absence of effective communication and collaboration between local organisations and SSR actors in Lebanon. Indeed, this paper argues that security agencies and donors can only develop ef cient and human rights driven SSR programs if they engage with Lebanese civil society proactively and reinforce the role of local organisations in the oversight mechanisms6. Building on previous research by Lebanese academics on ‘civil society’s role and efforts in security sector reform in Lebanon’7, this paper provides an avenue for increased participation of local organisations in current programs. It has been used to develop a human rights framework in SSR programs for security agencies and SSR actors. ALEF recommends SSR practitioners and actors to consult this framework in order to develop their SSR programs coherently.